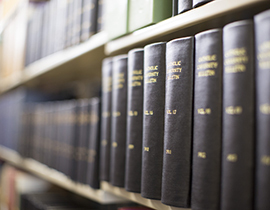 Christ the King Seminary Library is a Catholic theological research library of over 200,000 volumes providing for the curricular, research and instructional needs of the seminary's students and faculty and serving as a resource for the Western New York community. *Regular hours apply only when classes are in session during the Fall and Spring semesters. Hours are reduced during semester breaks, on holidays/holiday weekends, and during the summer. Hours subject to change without prior notice. All persons who belong to the seminary community have library privileges once their library cards are issued. All others must register before using the library. To register, call ahead to make arrangements to meet with a member of the library staff for a brief orientation and to fill out necessary paperwork. Access the Christ the King Seminary Online Catalog (or mobile version) for a listing of the items in the library collection - books, periodicals, newspapers and audio/visual materials. Current students and faculty may access the following EBSCO databases to find journal articles, book reviews, and essays in books: ATLA Religion/ATLASerials, Catholic Periodical and Literature Index, Philosopher's Index. Reference Service: Reference Service is available on site Monday - Thursday, 8:30 a.m. - 7:00 p.m. and Friday 8:30 a.m. - 4:00 p.m. during the school year when regular hours are in effect. Questions also can be submitted by telephone (716-652-8959) or fill out our Contact Library Reference form anytime (please note: we can reply to inquiries during staffed hours only - see above). Interlibrary Loan Service: Currently registered CKS students and faculty may use the Interlibrary Loan Service. Interlibrary Loan forms are available from any of the library staff. INFOPASS: Currently registered CKS students and faculty may apply for an INFOPASS to access resources in participating area libraries. Contact the Periodicals/Circulation Librarian or any of the librarians to apply. Books and audio/visual materials may be checked out for a period of ONE MONTH. Books must be renewed online, in person or by e-mail: no telephone requests. Maximum of one renewal per item. Reference books and periodicals (bound, unbound, and current issues) do not circulate outside the library. Books on reserve have limited or no circulation. Limited check-out of Reserve Books is restricted to students enrolled in particular classes. All books and audio/visual materials are subject to recall regardless of the due date. Recalled items must be returned in five days or less depending on the circumstances.. The mission of Christ the King Seminary Library is to serve the seminary in achieving its purpose: education and formation of candidates for ordained priesthood in the Roman Catholic Church, education of candidates for the permanent diaconate, graduate education in theological studies for men and women who wish to pursue an advanced degree and/or prepare for ministries in their churches, a program of continuing education, and the religious enrichment of individuals and groups within the Western New York area through sharing of its resources.